“Having been asked to judge the Young Drummer of The Year, I was really pleased to see, not only some very fine young musicians, but a great variety of different musical influences being employed by the players. Incredibly satisfying,when you consider the 1 dimensional music our youngsters are forced to listen to by our national radio and TV stations. “I can only admire and respect all the young drummers in the competition. It’s fantastic to see various players come back year after year growing musically and mentally. I always have a great time when I judge and always come away feeling proud to have been involved and lucky to have witnessed the start of some great drummers in the making. I wish “Young Drummer of the Year” was happening when I was in my teens. It is a fantastic event that gives young drummers a great reason to practice and be the best they can be. The standard is getting better each year and can only be a good thing for up and coming young drummers. Performing solo in front of professional drummers judge panel would make me nervous now so god knows how these lads must feel. Good on Mike for making this happen. 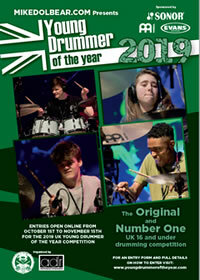 Good luck to 2011’s contestants…..
“When I attended the Young Drummer Of The Year event I couldn’t help but be totally blown away buy the standard of playing. It’s really exciting to see young people so dedicated to learning the instrument. “Young drummer of the encapsulates all that MikeDolbear.com stands for.